I don't know what Ashley and I were doing, lol. We like to fool around and live in our own world. Especially during photoshoot or videoshoot, we get plenty of time, haha. Shot a video for Bifesta last month. Had lotsa fun doing it because GBGTV girls are at it again. Believe it or not, the GBGTV team sits down and brainstorms before shooting every video. I was so happy that Jane and I proposed these ideas, everyone accepted it. This is what GBGTV does, I want girls to relate to us, I don't want to just shoot a commercial. Everyone notices my signature wing eyeliner. 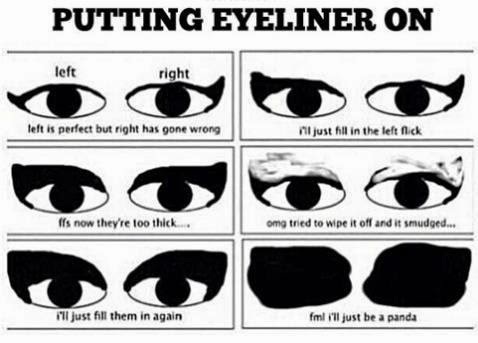 Hahaha, I can't live without my eyeliner, it's crucial for me, lol. For my character, I got this idea for being real. Yup, this is me, it's not easy to get even/perfect eyeliner on both eyes. This Bifesta Eye Make Up Remover is no joke. It's colorant free, fregrance free, preservative free. It contains hypoallergenic formulation which is suitable for everyone to use. I need to emphasize that it is WATER-BASED. I like my remover water-based. Very quick and effective, I didn't even have to rub. So, I wouldn't have to spoil my whole make up just because I made a small mistake. It can be used on lips as well. I thought of this idea and I couldn't stop laughing. When we were cooking up this story board, Ashley was in Taiwan. I texted her and I said "I have a perfect role for you to play, super funny!" She was like "don't sabotage me". Result came out good, no script at all, in just one take, she completed her part. Of course, we used the products before shooting this video. So, we know how the products work, hahaha! Let's just watch it here. Can't wait to bring more good stuff to everyone!